A total of 316 pieces of calcined mammal bone were recovered from the Town Brook Native American Site during the Phase III investigations. 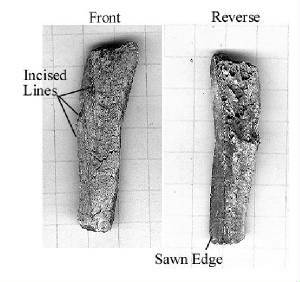 The types of bones recovered was consistent across all features where bone was recovered. The majority of the faunal material consisted of unidentified medium-sized mammal long and flatbone. Only two contexts, Feature 21, a buried A Horizon, and Feature 49, a pit excavated in the floor of the Native American house, did not yield and bone identifiable beyond medium-sized mammal. Features 15, 31 and 50 yielded fragments of sheep/ goat, two of which could be used to age the animal to between 10 months and under 3 and one years old. These contexts were a buried peat horizon (Feature 15), an A-Horizon overlaying the Native house floor (Feature 31) and the horizon below the house floor (Feature 50). Cattle bone was recovered from Features 23, the Native American house floor, and 31, the A-horizon overlaying the living floor. Fragments from Feature 31 indicate an individual under five years of age. Fragments from one deer astragalus were recovered from Feature 31. Fragments identifiable only as artiodactyl, were recovered from Features 41, 23 and 31, the peat horizon, the A-Horizon above the living floor and the Native American living floor itself.